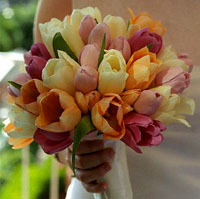 Your choice of the right wedding flowers can really enhance your very special day. For many people flowers are one of the most important elements of the wedding day. They add class, colour, fragrance, and life to the nuptials. After the bride's dress and the menu, the wedding flowers are one of the aspects of the day that guest will remember most. The flowers that you choose will be seen decades after the actual wedding day - every time someone looks at the photos and videos of the event. The choice of flowers are important as they enhance image of the bride and her bridesmaids, the church, and the tables at the reception. If you don't already have a favourite Irish florist then you could ask your family and friends for recommendations. If you've been to a wedding where you were impressed with the flowers then ask the bride who she used. There are lots of wedding fairs and shows where florists frequently display their wares. Our directory of bridal and wedding florists in Ireland below contains a number of outstanding wedding florists that have many years experience of providing perfect wedding day flowers for their clients.